Land yachting? 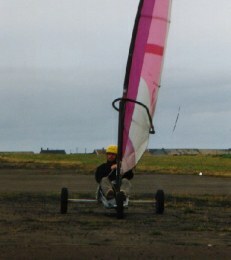 Sand yachting? It amounts to more or less the same thing. A perfect solution if you want to go sailing but aren't near a large body of water; or if you don't want to get wet! Ideally sand yachting would be on a beach (a large, flat, firm beach with not too many sunbathers), but land yachting is the more general term, for sand, deserted airfields, or any other suitable surface. Depending on the outside temperature there is also the possibility of ice yachting, but we won't go into that here. So what is a land yacht? Put simply, it's like a long, thin, three-wheeled buggy with enough room for one person to sit inside. The wheels are like small bicycle wheels, with tyres, and the single front wheel does the steering using foot pedals inside the buggy. Push your right foot forward to go left, and push your left foot forward to go right. It's quite easy. 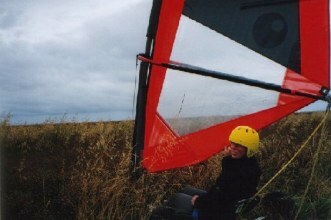 But of course it wouldn't be sailing without a sail, so attached to the top is what looks just like a windsurf sail. A rope is attached through pulleys to the sail, so that tweaking the tension in the sail, and the angle it presents to the wind, results in ever greater speed. And how do you stop? Well if you're looking for the brakes, then there aren't any. Or at least there weren't any on the ones we had. But of course the important thing is to go as fast as possible, and then you can worry about stopping afterwards. A group of us had a "taster session", just to give us the basics. 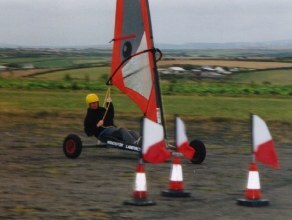 We used Windsport International, (see link below) using a disused airfield on a windy ridge in Cornwall. The session lasted about 3 hours or so, with two people per yacht, and provided a good general introduction with plenty of hands-on. Firstly we got to know the equipment, and before we put the sails on, we were shown the (very) basics. After a few dos and don'ts, and the issuing of the obligatory safety hats, we were ready to race. Although only leg-powered racing to start with, just to get the hang of the controls - we paired up and took it in turns to push the yachts, whilst the driver practiced steering with the foot pedals. So with at least the ability to steer, we moved on to the sail, and after simple instructions we all got to work assembling the sail and fitting it securely into the yacht. As well as saving time, (and the instructors' effort), the fact that we assembled everything ourselves gave us a good feel for the equipment, and an understanding of how it all fits together - and some feeling for how much wind the sail can catch when you're carrying it to the yacht. So now we were assembled, kitted up, instructed, and good to go. We started off negotiating a simple triangle, and attempting to stop within a given area (without brakes, remember). Some of us had a few problems with the stopping part, but everybody seemed to get the hang of things pretty well. Just don't put your feet out to try and stop! Once everyone had got the basics down, and building up a bit of speed, we moved to a very big figure of 8 circuit marked out on the airfield, where we could really let loose. Fortunately the wind which often gusts over this ridge didn't disappoint, and allowed the yachts to really get up some speed. 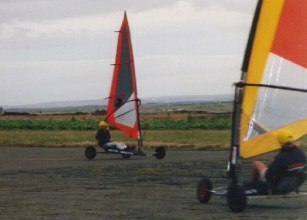 Obviously these were just beginner ones, and the fancier, lighter racing ones will go far faster. But even so, we soon felt the buzz of two-wheel racing, balancing the steering and the throttle to great enjoyment. And after the taster session? There are several places offering these taster sessions, which are a really good way of trying it out at low cost. 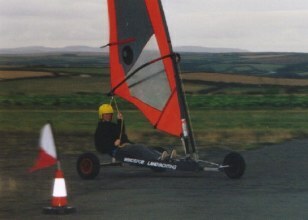 And it's easy to learn the basics and have some good clean fun (no smelly go-kart engines!). If you got hooked and wanted to take it up properly, you would need to ask around the local clubs to see if you could borrow their equipment, at least until you took the plunge and bought your own kit. Dale racing against the old guy (and about to lap him for the fifth time). Emma doing a fine job of blurring those cones. Emma discovers that land yachts don't have brakes after all. A grinning Steven corners at speed. Emma tearing along the back straight again. and gets on two wheels as the instructor looks on in horror. Head-on collision between Dale and the camera imminent. Windsport International - Mainly a sailing centre in Falmouth, UK, but also runs Land Yachting at Perranporth, UK, where we did it. 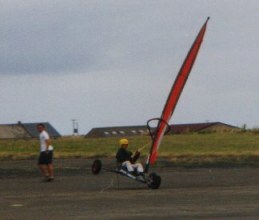 bfslyc.org.uk - Home of the British Federation of Sand and Land Yacht Clubs. Windjet - a British bid to break World speed records for wind-powered craft on land, ice and water. 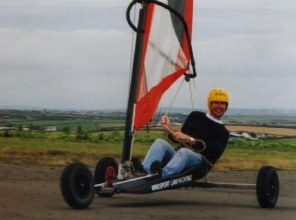 In 2009 broke the world land speed record for wind-powered vehicles reaching 126.1 mph (202.9 km/h) - see the BBC or greenbird.co.uk. Page last updated August 2005. Feedback welcome at mail@activityworkshop.net.